I’m moving to….. | Words, By George! It’s a sacred ritual of American elections that supporters of the losing party threaten to leave the country, and then of course do not. 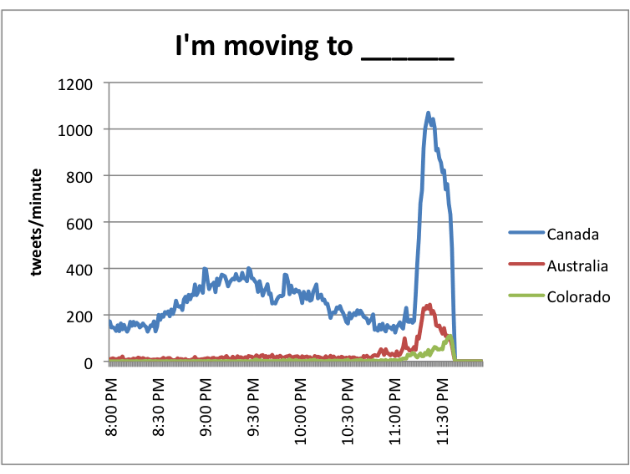 We can see this phenomenon in effect by examining instances of the phrase “I’m moving to [country]” on Twitter around the time the election was called. Curiously, Canada–long the imagined haven of liberals in years in which Republicans win–is the most popular choice. (Perhaps it’s just close?) Australia comes in second, followed by … Colorado? The people promising to move there are perhaps motivated by electoral news other than the winner of the presidency. The sad thing here is that Americans don’t seem to know that Colorado is in the USA!